Common aluminum-coated substrates include PET, BOPP, CPP, etc. After coated with vapor deposition of aluminum, aluminum-coated films such as VMPET, VMBOPP, and VMCPP are formed. The barrier properties of aluminized films may vary with different manufacturers, evaporation processes and even different batches. The differences are in thickness, density of the aluminized layer, and the COF between the aluminum layer and the substrate. This article introduces a study on whether the substrate of an aluminum-coated film will affect its barrier properties. Since aluminum foil is a high-barrier material, packaging materials composed of aluminum foil have high barrier properties. However, this can drive up the cost significantly. In contrast, aluminum-coated film has a lower cost while maintaining effective barrier properties. It is widely used in industries like food, pharmaceutical, household chemicals, etc. The test uses two types of aluminum-coated films, VMPET and VMBOPP, in similar thickness as samples, compares their OTR. There are two common methods of OTR testing, i.e. differential pressure method and equal pressure method (aka. coulometric method). The tests are performed in accordance with ASTM D3985, Standard Test Method for Oxygen Gas Transmission Rate Through Plastic Film and Sheeting Using a Coulometric Sensor. The testing instrument is C230G Oxygen Transmission Rate Test System developed and manufactured by Labthink Instruments Co., Ltd.
Coulometric method is also known as equal pressure method. The pre-conditioned specimen is mounted between the upper and lower test cell chambers. Next, the chambers are purged with nitrogen at the same flow rate and O2 is switched into the upper chamber. Due to the concentration difference between the two chambers, oxygen molecules permeate through the specimen into the lower chamber and are carried to the coulometric sensor. The sensor then generates proportional electrical signals. By analyzing these signals, the OTR is obtained. The test range of film/sheeting is 0.005 ~ 200 cm3/(m2?day). The test range of package is 0.000025 ~ 1 cm3/(pkg?day), with the resolution of 0.0001 cm3/(m2?day). The repeatability is 0.005 cm3/(m2?day) or 2%. The internal temperature and humidity of the instrument are automatically controlled by the temperature and humidity sensors, maintaining the stability of the test specimen environment. The test temperature range is (10±0.2)℃ ~ (55±0.2)℃. The test humidity range is 0%RH, (5±1)%RH~ (90±1)%RH and 100%RH. Three identical or distinct specimens can be tested simultaneously. The specimen size is 108 mm × 108 mm. The test area is 50 cm2. Unique, optional, DataShield TM system, meets the requirements for centralized management of user data. It supports a variety of formats of exported data. Reliable security algorithms are used to prevent data leakage. It supports universal wired and wireless LAN, optional private wireless network, and supports third-party software. The instrument is applicable to determination of OTR of various plastic films, paper plastic composite films, co-extruded films, aluminum coated films, aluminum plastic composite films, sheeting of PP, PVC, PVDC, metal sheet, rubber sheet, silicon wafer, wine bottles, coke bottles, peanut oil bucket, tetra pak, vacuum packaging bag, three-piece metal can, plastic cosmetic package, toothpaste tube, jelly cups, yogurt cups. The instrument can also be used to test the oxygen barrier property of sealing lids, solar panel sheets, pipes, medical blister packs, automotive fuel tanks, and battery shells, etc. Cut 3 pieces of specimens from the VMBOPP sample material with sample cutter. The size of each specimen is 108mm x 108mm. Clamp the three pieces of specimens in the three test cells and fasten the clamping device. Set specimen name, test temperature, humidity and other parameters, then start test. When tests are finished, the test results of 3 test specimens are displayed automatically by the testing instrument. In this test, the oxygen transmission rate results of three pieces of VMBOPP specimens are 50.0341 cm3/(m2?day),51.4492 cm3/(m2?day) and 58.8713 cm3/(m2?day). The arithmetic mean is 53.4515 cm3/(m2?day). The oxygen transmission rate results of three pieces of VMPET specimens are 1.0287 cm3/(m2?day), 0.9347 cm3/(m2?day) and1.0973 cm3/(m2?day). The arithmetic mean is 1.0202 cm3/(m2?day). The OTR test results showed that VMPET has better barrier properties than VMBOPP, which may have correlation with the better barrier properties of PET than BOPP substrate. The test process is simple and the testing instrument is easy to operate. The test results have reliable accuracy and repeatability. Labthink Instruments Co., Ltd is a technology company specializing in research & development of packaging testing instruments as well as packaging testing services. The new C series instruments include the infrared sensor method, coulometric sensor method, electrolytic sensor method and gravimetric method. 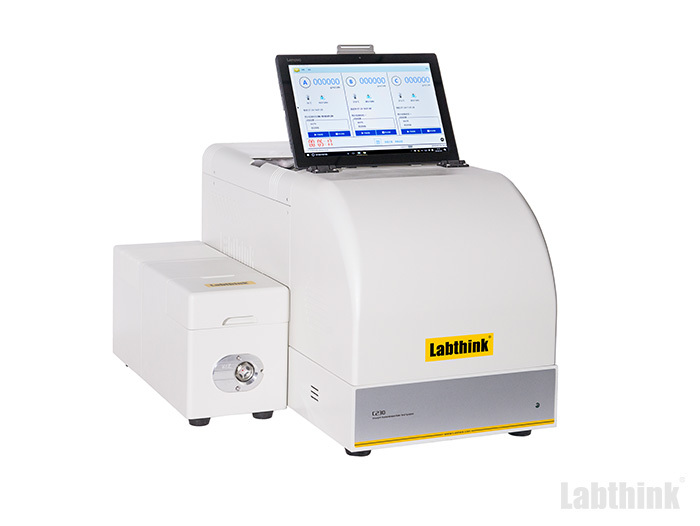 The instruments are also equipped with Labthink’s self-developed sensors which allow for more stable performance, higher efficiency/accuracy and better repeatability and reliability.